"Clint's back!...and 'Kookie' is with him! The year's big new thrill on the big theatre screen!" "Always, the Kid strained to match Big Kelly's stride...and finally did, one Indian-screaming afternoon...."
A solid, no-nonsense oater. 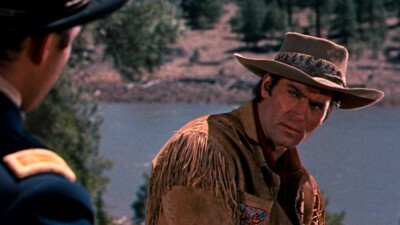 Warner Bros.' Archive Collection has released Yellowstone Kelly, the 1959 big-screen Western starring man-mountain Clint Walker of TV's smash-hit Cheyenne, along with other Warner TV contract players Edward "Kookie" Byrnes (77 Sunset Strip, Dad), John Russell (Lawman), and Andra Martin. No extras, of course, for this good-looking Archive release, but it's always a treat to see well-remembered-but-little-seen library titles like Yellowstone Kelly pop up on disc. The time: the months following General Custer's massacre at Little Big Horn. Fur trapper, surveyor and Indian scout Yellowstone Kelly (Clint Walker), the first frontiersman to cross the Yellowstone Valley, has come down to meet the riverboat Far West to trade in his wolf skins for more traps. Having enjoyed seven years of peaceful coexistence in the Sioux-controlled lands, Kelly isn't about to entertain newly-transferred Major Towns' (Rhodes Reason) request that Kelly map the unknown territory south of the Dakotas, leading the firefight-spoiling major to the Sioux nation. Kelly understands the major's two-fold reason for taking on the Sioux: revenging Custer's death, and securing a promotion in the process. Kelly swears off the deal, and gives an equally firm "no" to shavetail Anse Harper's (Edward Byrnes) request to tag along with Kelly as a helper. Kelly likes being alone, and he's not interested in minding after a tenderfoot in the treacherous, lonely Sioux country. 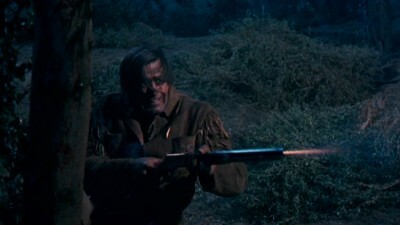 Kelly soon changes his mind about Anse once he sees how willing he is to impress the experienced trapper, but the untried Anse will be of little help to Kelly when Sioux Chief Gall (John Russell), captures the two men and gives them an ultimatum: save the life of injured Arapaho captive Wahleeah (Andra Martin), or face torture and execution by his White-hating nephew Sayapi (Ray Danton). It doesn't help matters when all the men fall in love with the beautiful blue-eyed Indian princess. 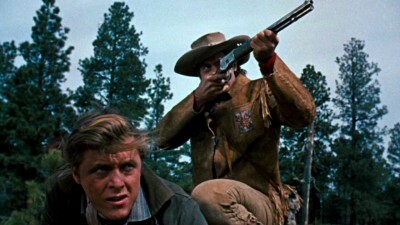 Yellowstone Kelly certainly won't make anyone's Top Twenty list of the most influential or most important Westerns in Hollywood history...and that's just fine with me, because if there's any genre that can consistently deliver the maximum amount of enjoyment out the barest minimum of conventions, it's the Western. Often with a Western--particularly when it's a professionally produced, slick studio offering like Yellowstone Kelly, directed by one Hollywood's more dependable journeymen, Gordon Douglas--it's enough just to see a tough-looking hombre like Clint Walker break the back of an equally huge horse as he holsters his Winchester and rides along the mountain trail...in Technicolor® and widescreen, of course (the location shooting at the Coconino National Forest in Arizona is spot-on). The pleasures of the Western genre can be exceedingly simple (the open spaces, the excitement of fast-gun play, the romance of the mythologized cowboy/loner/gunslinger), and equally satisfying emotionally and intellectually when the genre stretches to include genuinely complex themes and motifs such as the clashes of culture between Whites and Indians, or the expression of "maleness" through action. 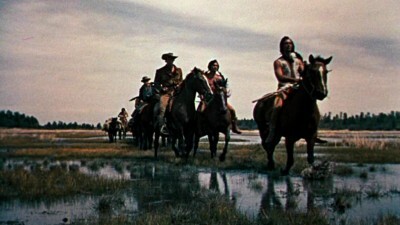 I can find just as much satisfaction in something as deep (and troubling) as The Searchers or Man of the West, as I can for something more accessible, such as Yellowstone Kelly, because it's all still horses and guns and the vast, open stretches of wild, untamed land. In Yellowstone Kelly, there are attempts to bring a more thoughtful tone to what would otherwise be a thoroughly familiar group of Western subplots. With a screenplay by soon-to-be Western director-of-note Burt Kennedy, based on a novel by celebrated author Henry "Heck" Wilson Allen, Yellowstone Kelly's various plot threads certainly wouldn't have been unfamiliar to the dedicated Western fan back in 1959. 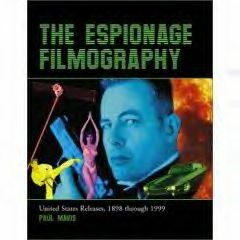 The solitary, loner Westerner caught between the warring White and Indian cultures; the grizzled veteran teaching a shavetail the ropes of survival out in the hostile land; the tension-filled romances between an Indian beauty and the various men who wish to possess her; the duplicity of the Army and the American government in their dealings with the various Indian Nations; and an internal family struggle within an Indian tribe, had all been dealt with before on both the big screen and on television by 1959. Still, while Yellowstone Kelly may not strive to look at these complex themes too closely, it's enough that they're there, with an admirable brief straightforwardness to them that never gets in the way of the main story arc, a tone well-matched by the leads' low-key performances. 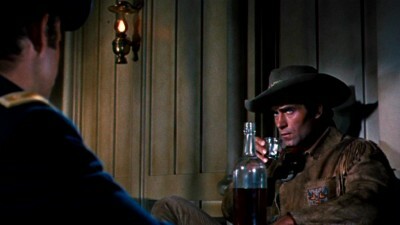 Remarkably imposing physically, with a contrasting quiet, almost graceful line delivery, Walker easily dominates all of his scenes, lending a quiet authority to the character that goes a long way towards making believable those taciturn lines of dialogue (Walker worked previously with director Douglas on 1958's Fort Dobbs, and would collaborate again on 1961's Gold of the Seven Saints. At a trim, fast-moving 92 minutes, Yellowstone Kelly doesn't screw around; its concerns are laid right out there. 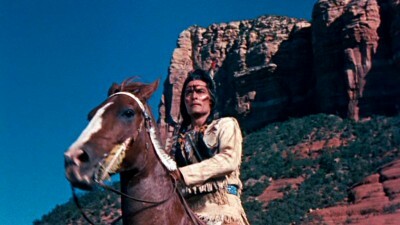 In his first meeting with Major Townes (within the film's first ten minutes), Kelly sets the record straight about where he stands as to the treatment of Indians by "we Whites," in some commendably lean dialogue. He may be up in the hills trapping wolves most of the year, but he knows the score. Defending the Sioux's right to defend themselves on their own land, Kelly chastises the Major, stating plainly, "Words on paper don't mean a thing unless they're lived up to," referring to the treaty at Laramie that the Sioux signed in good faith with the Army. When Townes answers with, "But they have no right," Kelly replies, "Not anymore they don't. We Whites saw to that." Kelly immediately understands what Townes is up to: revenge and promotion, and he'll have no part of it. The Sioux have been fair to him. If I had my wish, I would have liked Yellowstone Kelly to explore that even-handedness of Kelly's more, as well as the interesting development later on that unfolds, when we learn Kelly has enjoyed 7 years of peace with the Sioux not so much because of his own skills of even-steven diplomacy but solely because Gall has ordered his warriors to remain "hands off" with Kelly, because Kelly once saved his life when he was a young warrior. Unfortunately, Yellowstone Kelly doesn't have time to dwell too long on those potentially interesting ideas. Probably the film's weakest element is the Wahleeah subplot, a plot development that feels forced and tacked on (due, no doubt, to considerations of box office for female ticket buyers). 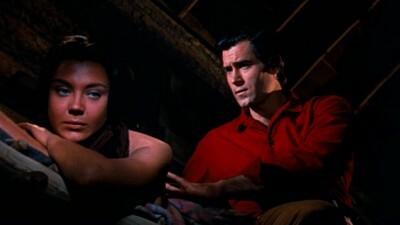 Although Martin is fine as the Arapaho captive (she gets a showy scene where she graphically screams in close-up as Kelly performs some frontier surgery), bringing out Byrnes' quiet, romantic qualities during their scenes together (lots of dreamy shots of "Kookie" for the hep-cat teenyboppers out there in '59), she has little to do in the film. Playing right into the stereotypical depiction of all beautiful Indian maids immediately taking up with the handsome cowboys, there isn't nearly enough background on the character for us to believe she'd eventually fall for Clint (except for his obvious charms), with her presence in the story seemingly more useful as merely a goad to egg on crazed White-hater Ray Danton (another clichéd, poorly developed character). Too pat, as well, is the film's resolution, where a simple sentence from Kelly dissuades Gall from continuing on the warpath. With that rushed denouement (and a truncated final Indian attack that promised much and then kind of fizzled out), Yellowstone Kelly really begins to feel more "TV" than "feature film" at the end here, and that's a shame, considering how assured and confident this good-looking film was up to that point. 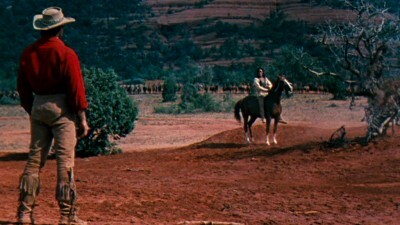 The anamorphically enhanced, 1.85:1 widescreen video transfer for Yellowstone Kelly looks quite good, with cinematographer Carl E. Guthrie's wide-open Arizona landscapes popping nicely in the slightly muddied Technicolor®. Scratches and white and black specks are present, but they're not distracting at all, while compression issues did not arise. The Dolby Digital English audio track is big, fat mono, and it's transferred here at an agreeable level, capturing composer Howard Jackson's full-bodied score quite well. No subtitles or close-captions, however. As with almost all the Warner Bros. Archive Collection cut-on-demand discs, there are no extras...although for this particular release, Warner had the brilliant marketing idea of having none other than the Big Man himself, Mr. Clint Walker, personally autograph the first 300 ordered discs--a ridiculously low number, if you ask me, since I would imagine there would be thousands of fans who would have jumped at the chance at having that kind of collectible (for practical reasons, such a low number might have ultimately hurt sales, since once Warners announced the copies were sold out on their website--within a matter of hours, I'll bet--a lot of potential buyers said, "Skip it."). Sadly, my copy was not one of those 300 (but you can email anytime, Mr. Walker). Unpretentious, assured Western fare, which only falters (slightly) at the end. 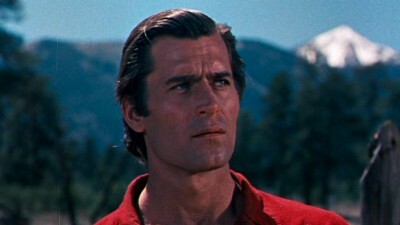 Clint Walker, with that massive frame, deep voice, and surprisingly gentle manner, is perfectly cast here as Yellowstone Kelly, a loner who reluctantly gets drawn into not only an Indian war, but also a friendship with a shavetail innocent, and a romance with a beautiful Indian maiden. Directed by old pro Gordon Douglas (who couldn't help but direct straightforward, enjoyable genre fare for decades), Yellowstone Kelly is slick Western entertainment, presented at a speedy clip. I recommend Yellowstone Kelly.